1. Lie on your back with your legs fully extended and your arms bent and by your sides. 2. Lift your torso off the floor, bend your right leg and bring your right knee close to your left elbow. 3. Slowly return to the starting position, and crunch to the opposite side. Tighten your core and breathe out as you lift your torso off the floor and crunch to the side. Maintain your back straight at all times and keep your head and neck in a neutral position. Inhale as you slowly lower your body back to the floor. The sprinter crunch fully engages your abs and obliques and helps to define and cinch your waist. 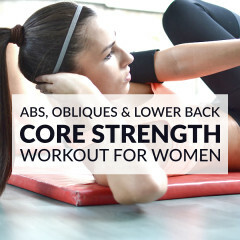 To get the full benefits of this exercise it’s important that you tighten your core, and that you keep your back straight and stable throughout the exercise. 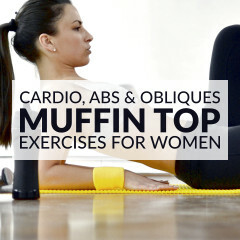 Practice doing planks, bicycle crunches and seated knee tucks first. Once your core is strong enough, advance to the sprinter crunch and complete 2 or 3 sets of 15 to 20 repetitions.